I'd like to know where the week went! I spent the first part of the week working on the handouts I am going to use for a visit to the Dayton Knitting Guild in March. I will be teaching basic seams and since I didn't have an official handout on that topic, I took parts of my finishing class. I'll also be doing my 10 Ways (Plus 1) to Improve Your Knitting talk twice, once in the morning and once in the afternoon. Just a reminder to all students...if possible, take photos of your swatches, front and back, before you send them off. I email my letter as soon as I do the review and it might take several days (or if you are in Canada, WEEKS) to get the swatches back! I received a lesson from my student in Bayreuth and she was nice enough to send a postcard. It is on my bucket list to go to Bayreuth for the festival. No suggestions from Maris, I am disappointed to say. This week's topic is Judy's Magic Cast On that I use for socks since I prefer to do them toe up. Also, this cast on is the EASIEST way to do a provisional cast on directly to the needle. I was reminded of that as I am working on a sweater where I have used just about every technique. Doing a sock toe up was a pain before Judy Becker invented this cast on. I have intentionally blocked out the other techniques which included doing provisional cast ons and then grafting them. Since socks generally are knit with finer yarn and smaller needles grafting can be problematic. Basically you cast on stitches using two needles. Here is the RS with a few stitches cast on. If you are doing socks you want to use one circular needle. 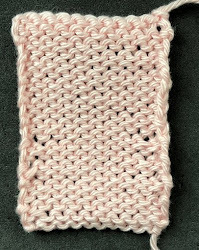 If you are doing a provisional cast on, you want to use two circular needles. It is the RS that truly shows the "magic" of this cast on. Notice there is a perfectly formed reverse stockinette row. Next week I'll do a video on a cast on which produces a very elastic edge which is perfect for lace, unless someone has a better idea. By the way, using larger needles for an elastic edge just produces an ugly first row. I really wanted to do the Salon on Saturday but the combination of Valentines Day and the UK basketball game convinced me that it is a stupid idea. Salon will be on Saturday from 2-4 pm. I spent the early part of the week swatching for the Wine Dark Sea. Here are the results. Originally I was going to use the color choice from the upper left corner. I didn't like this so then I did swatches alternating with the blue and then the red. I decided I liked the red best as it matches the name better. Then I did two swatches showing that configuration. I've decided to go with the one in the lower left. I am not going to work on it until I finish my blue sweater. I started it years ago to replace a much loved sweater I had had for nearly 20 years. I'm using Miss BabsYasmin Lace (80% merino and 20% silk). It is a very hardy fiber combination. Most of what I knit falls into the category of "process" knits. I enjoy the process as much as the product. This is a product knit. It is no fun to knit at all but I am looking forward to wearing it. I am almost finished with the first sleeve but since the finishing on this thing is so meticulous I decided to get started. I can only work on it in natural light. The front bands were worked at the same time as the fronts. They fold over. I spent hours doing them. Here is the WS of the button band. And here is the sweater. You can see it is VERY simple but that is what I wanted. I'm hoping to finish it up in the next two weeks. The cuff of the sleeves start with 106 sts so you can see why it is a produce knit and it taking forever!